Students who have been told they cannot complete their NCTJ qualifications say they are “extremely disappointed” after meeting college leaders who are axing their course. HTFP reported last week how 14 students in the first year of their course at Fife College have been told they will not be able to complete their Higher National Diploma in practical journalism unless they transfer to another course 155 miles away at the University of Sunderland. The students will instead graduate this year with only the Higher National Certificate in practical journalism, leaving them without NCTJ qualifications because exams are set in the HND year of the course. However, the college has hit back and claimed the students knew they would not be able to take the HND year at Fife when they initially signed up for the course. According to the National Union of Journalists, affected students met with college officials on Monday. 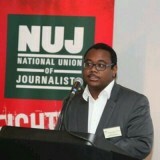 The NUJ quoted a student spokesperson as saying: “The class is extremely disappointed with the outcome of this meeting. The NCTJ has said it is investigating the matter and has encouraged affected students to get in touch for advice. Dominic Bascombe, pictured above left, NUJ Scotland organiser, said: “The closure of this course is a worrying situation for students hoping to develop the solid foundation they need to enter the industry. The number of colleges offering fully accredited courses is shrinking in Scotland and it is vital that students have the opportunity to study journalism. A spokeswoman for the college said: “Fife College has offered the HNC/HND in Practical Journalism for several years and both were included in our 17/18 Prospectus. Following a review of the academic portfolio earlier this year, the college concluded, regretfully, that it could no longer continue offering the HND due to low numbers. “Only seven students are undertaking the HND in 2017/18 and we estimated that the numbers progressing on to the HND course in 2018/19 are likely to continue at this low level. The decision also reflects our assessment of supply and demand and the current and future needs of employers and our regional economy. “Students signing up for the HNC did so on the basis that they could not progress to HND at Fife College in 2018/19 and they have been advised that there are a number of progression routes available at other colleges for entry into the HND or Universities which provide journalism and/or media and communications degrees. We have met with the students this week and will continue to meet with them to ensure they are fully supported as they progress their studies. “We will continue to offer the HNC Journalism course at Fife College on the basis of current numbers. We will strive to increase these numbers if possible through marketing and working with schools and other stakeholders to promote what the College has to offer. The College is disappointed that the HND Practical Journalism course is no longer viable.